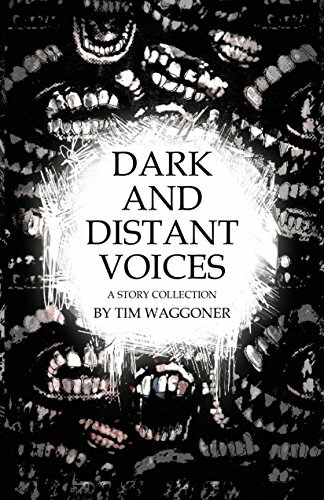 Tim Waggoner’s Dark and Distant Voices: A Story Collection is quite the short story collection. Bizarre, weird, and utterly intriguing the stories found here will get under your skin. Included are stories from past publications and one original to this collection. Accompanied by interior illustrations done by Luke Spooner, who by the way also did the cover art, this makes for one totally brilliant read. Waggoner takes ordinary everyday situations and twists them into a mind-bending reality. You know, like when you pass by someone and do a doubletake. Yeah, but rather than stopping you continue on and then begin to obsess was that who you thought it was. Or, how about that guy who can’t let go. Living in the past becomes his reality until the past catches up with him. Sometimes it’s just a simple trip to out to take care of business or the meeting of someone new that can cause feelings of unease. You begin to doubt yourself, am I being paranoid? Every once in a while, you really should heed that inner voice. Reality is skewed when life-giving sunlight can drain the living of what we thought it was giving. Where the term rebirth becomes a literal experience. Where… what we thought was going to be an enjoyable reading of short stories leaves us feeling discombobulated and a bit taken aback. Oh, don’t get me wrong, I did enjoy all these tales and I think you will too. For me, my take on the cover art says it all, reality bites! The subtle horror lurking within each story will surely make this one memorable collection. Don’t pass this one up, you can get your copy HERE! !